The highest form of economic use of hunting resources is farming. The case is brand new, but already had time, over the last 15-20 years of its existence, to prove all their utility and profitability. In Russia we have a primitive form of keeping and rearing in captivity (but not breeding) of fur-bearing animals have long been known. But it is also known that the skins of the grown, or content in captivity fur-bearing animals (the so-called “cormenon”), have been considered significantly lower skins of the beast, produced on the hunt. This is due to the inability to feed and contain the beasts. In the right way, grown and reared, and especially bred in captivity fur-bearing animals always give skins a higher quality than completely wild, the products of hunting the beast. Captive breeding of fur-bearing animals originated in North America. The first American experience with breeding silver and silver-black foxes soon proved not only the possibility of their breeding in captivity, but the enormous profitability of this business compared to direct hunting and all other forms of agricultural labor. Starting out small-with some pairs of foxes — American soon lit them dozens if anything, thanks to the skillful crossing, have improved the fur of the resulting offspring. Currently, fur farming is widespread in North America and people involved in them, gives a huge income. In order to explain how much the value has already industrial farming point out the fact that among the 15,000 skins of silver foxes, sold in London (the centre of the world fur market), 13000 was obtained from the Fox kennels and only 2000 produced on the hunt, what the most valuable of them were taken by the nurseries. 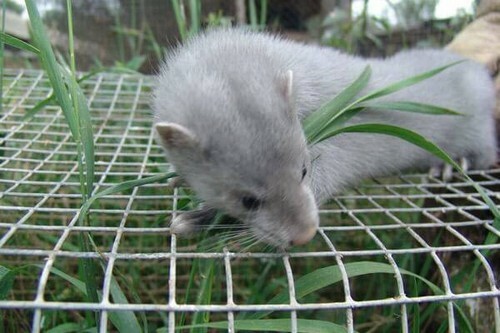 Fur farming we have in Russia is scarce. Meanwhile, the industry application of human labor is so simple, does not require the investment of large capital and so profitable that the breeding of fur-bearing animals in captivity, even the poor, would in the very near future to get the widest spread we have. Breeding in captivity lends itself to every fur-bearing animal from high-value silver foxes and sable to squirrel and polecat inclusive. Of course, the most profitable is the breeding of fur-bearing animals that have valuable furs. But of course, as a precautionary should start breeding less valuable animals to them to acquire the experience, the lack of which will not be able to make up any one book and who would deliver in the future, when breeding is more valuable fur-bearing animals, from those fatal mistakes that can lead to the death of Pets, due to their high cost will definitely affect the pocket of a novice zveroboja. Due to the sharp differences existing between home, accustomed to humans, animals, and wild animals as fur-bearing animals, and their breeding and care differ from the methods that apply to Pets. The latter contain in the home state, and fur-in the peri-domestic. As a result of the savage and the fur it is necessary to deprive him of the opportunity to escape, and put him in a situation in which he would feel not only safe, but possibly in a natural setting and was able fearlessly to procreate and raise offspring. The first is achieved by the device cells. Material for cages is usually wire mesh. For animals, well able to dig (Fox, Fox) have dug the net to yards in the ground or underground floors of logs. For animals, good climbing (sable, marten), have the same mesh to do the roof, i.e. to make the cage solid, not fenced at sides. The second is achieved as a large enough size of the cell, and leaving vegetation, shrubs and trees, and the device inside the cage of the booth, with a special socket, good defrosted hay or straw. The socket is of such size that the beast could only be. In the booth the beast is hiding from danger. The entrance to the booth through a wooden pipe. The cell size, the booth of the nest, the location of the cells and details of the device of the nursery depends, of course, because the kind of animals they are intended. As mentioned above, to breed in captivity can be all fur-bearing animals such as Fox, foxes (all colors), sable, marten, otter, mink, polecat, etc. Fur-bearing animals are the most diverse species and disposition, and therefore to contain and care for them differently. First of all you need to choose a suitable place for the nursery, so it was quiet, peaceful and away from the road. Cage size for one pair of foxes from 4 to 16 square yards, preferably with equilateral sides. The grid cells which should not exceed 2 inches, is made of iron wire, the thickness of a match, and is stretched on wooden poles, vryemya in the ground every 1/2 fathoms. You can surround the cage with mesh only on two sides, making the remaining walls standing boards. The height of the mesh above the ground 8-10 feet. So the Fox couldn’t dig under the mesh, do this: dig under the mesh a ditch depth of one Arshin, and lay it with rocks or each other lying logs. The mesh bottom is nailed to a wooden Okladnikov. On the upper edge of the cage made of wood or from the same mesh width in feet canopy, sloping inward, preventing the beast to climb out of the cage. Such cells done so much, how many manufacturers available in the nursery. Distance between adjacent cell walls must be at least, otherwise Fox might bite each other’s feet. All cells at a distance of 3 -5 seven feet high fence plank fence so that foxes nothing and no one bothered. Inside the cell it is desirable to have small trees. Fox house or booth, which serves to rest and sleep animal shelters and output, and feeding the young, should be in the following sizes: a height of 3^4 feet, length 5 and width 3 feet. The roof of the shed, lifting. Inside the house finds a “nest” of inch planks of the following dimensions: length 1 foot 10 inches, width 1 foot 6 inches and height 1 foot 8 inches. The entrance to the socket 8 by 8 inches, is cut from the side wall. Ceiling jacks lift, floor upholstered plinths. The space between the socket and the walls of the booths stuffed with moss, sawdust, etc. for heating. The entrance to the booth through the tube, the size of a 10 inch height and 9 inches wide with a length of 4 feet. The house is with double walls to avoid cracks and put on foot of height of the leg so that the pipe descended obliquely downward. The outlet pipe is obstructed by the Board from direct wind and light. The ground under the house lined with fieldstone or tight house with a wire mesh floor to the ground to foxes not to dig. Through the walls of the booth through the ceiling of the nest should be made by drill some through-holes to avoid stagnant air. Fox is easily tamed, and taming the most favorable impact on the successful birth and rearing of young. To feed the foxes need 2 times a day, morning and evening at certain hours. Morning Fox give bread, cereal, milk, night-meat, fish, guts, bones, etc. For a day is usually enough 3/4 of a pound of food for a Fox. Holy foxes feed more abundant. Winter cottage meat feed increases, summer decreases. Foxes can not overfeed and it is necessary to diversify the food, but it is not giving spoiled. Waterers and feeders should be kept clean, often scalding with boiling water. In summer fresh water should be given every day, but in winter fresh and clean snow. Sick foxes should isolate and treat without meat. From diarrhea to give a teaspoon of castor oil with two drops of turpentine. From worms – 1-2 grams of Kamala beach. From insect Persian powder or wash in a three percent solution of creolin. In the month of December, you choose the producers for pairing selected and put in the same cage. If they don’t get along, male has to be replaced by another. Estrus occurs in February and March. Mating is the same as in dogs. The female is 50-54 days and lays from 7 to 12 cubs. After mating the male is deposited in another cell. When cubs are born, you need to avoid often go to the cage. All you need at this time to protect the female from any anxiety, noise, etc., as a female, especially the young, begins to drag, toddlers teeth, searching for secluded places, and as a result cubs often die from slip and colds. In this case, in order to avoid their death, should take away cubs from the mother and plant. cat, kittens and to throw the cat usually feeds her cubs as his own. If the cat doesn’t have to feed the cubs with a horn. In the third week they opened their eyes, and the cubs start to lap up the milk. Gradually translate them into porridge, bread, broth from the bones, and then fish and meat (cooked first), giving the food 3 to 4 times a day. To annual age until the cubs grow, they are fed their fill. After 10 months, they are already married, and one-year-old in turn bring young. Foxes breed once a year. Breeding of Arctic foxes, as related to the Fox animal, very similar to the breeding of foxes. Fox more prolific than Fox (brings to 16 pups) and easily tamed. Cage and nest plus are the same as Fox, just a bigger size (about 25 sq. blacks. for a pair of foxes). Feed Fox are: small fish, mouse carcasses of rabbits, squirrels, etc. willingly Eats the Fox and plant foods and drinking milk. Salt is harmful to him. Toddlers almost always manage to bring up under her mother. More profitable to breed blue foxes, as more valuable, as well as foxes dark color (silodosin, silver and silver). Martens breed has long, sable began only recently, but nevertheless we can confidently say that the sable breeding in captivity is possible. In the same way as when breeding foxes, cage for Sables or Martens is made from wire mesh, the floor is done or from the grid, or planks and covered with a layer of earth, with a thickness of 1/4 yard. As Sobol, “very well digging the ground, then the grid must be released not less than a yard in the ground, under the net dig another groove up to 1 /2 arshins of width and depth. This groove was Packed with stones (rocks) and put them in the bottom of the mesh so that it was pressed, and all tightly clog the ground. Booth is placed on a shady place and made of double boards. The nest is 10 to 12 inches while the height was 10 inches. It should be warm, and because it is upholster with felt and lined with soft material. The entrance to the nest box and cut 6 inch height and 5 inch width, but not at the bottom of your searches, and top and side. Pipe is not required. A roof over a booth made of planks, as the sable and the marten are moisture. Sometimes, instead of kennels for Sables and Martens put a segment of a hollow tree. The bottom of the deck thoroughly hammered, the top closes tight roof, side height 1/2 yard cut a round hole inch in 5-6. In the cage put the moss, wool, of which the sable and the marten arrange themselves in the hollow of a warm nest. In a cage you must leave the abundant vegetation and especially trees, which are the sable and the marten love to climb. Feed 1 time per day and more raw and fresh meat (about 1 pound a day), but gradually, and bread, milk, etc. Sobol should give some more plant food than the marten. Martens and Sables should be fed bread and milk, and as they growth and meat and fish food (mice, chipmunks, squirrel and rabbit carcasses, poultry, fish, etc.). Each cell hold only one animal, and if you have to keep in pairs, on the eve of the breeding season (February, March) they should be seated. The male let the female for a day and no sooner than she entered the hunt, as determined by careful observation and scientific experience. After mating the female is offered a separate room and the male can be let to another female. 4 to 6 females 1 male. All the time of oestrus and subsequent 9 weeks of calving should observe complete silence and not to open the nest up to that time, while the cubs will not to come (in 2 months). If the female is anxious, it can destroy their young, and the remainder will have to be replaced under the cat. The litter is from two to six cubs. By autumn the young reach old growth. Limited to these short instructions about how breeding in captivity of fur-bearing animals, we reiterate that this case is absolutely brand new and still little studied and that only personal experience and observations of sweroad can fill those gaps that are inevitable in any “Guide”. Industrial rearing of fur-bearing animals in captivity have a future, and we urge all hunters to organizations everywhere nurseries, fur-bearing animals, as profitable and higher forms of economic use of hunting resources.